On tap, tepid golden autumn ale gets metallic as shallow pumpkin pie spicing and soapy backend disrupt tingly-hopped brown-sugared cinnamon-nutmeg-allspice nicety. Astringent gourd likeness hampers cereal-grained finish, lowering appeal further. 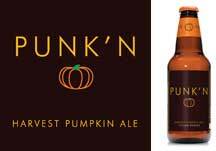 But bottled version displays better cinnamon-spiced pumpkin character overriding whiskey-malted pumpernickel-rye abatement.